Lobbyists Spending Millions To Sway The Undecided On Iran Deal : It's All Politics The groups' targets? Democrats undecided on whether to accept or reject the deal when they vote this fall. The campaigns include tens of millions of dollars spent on TV ads in nearly two dozen states. 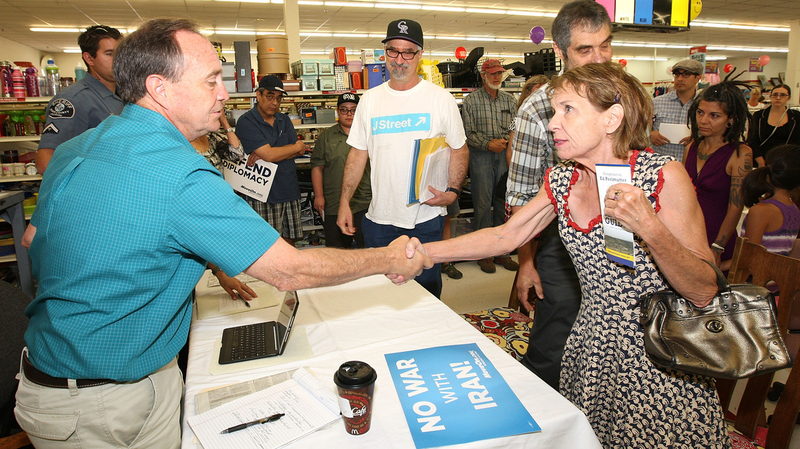 Rep. Ed Perlmutter shakes hands with Carlyn Meyer and other members of the groups J-Street and MoveOn.org as they urge him to support the Iran nuclear deal at an event in Denver. J-Street plans to spend about $5 million on ads in this fight, which is vastly dwarfed by the $20 million to $40 million from groups like AIPAC that oppose the agreement. Congress has left town for the August recess, but members won't be escaping the lobbying blitz on the Iran deal that's sure to hound them back home. That's because a vote that could kill the deal is coming up days after they return in September. The lobbying barrage has focused on a band of undecided Democrats. When you listen to lawmakers talk about the Iran deal, they'll hit on themes like national security, diplomacy, morality. It's a debate about heady ideas, and a swarm of outside groups is now pouring millions of dollars into steering that debate. On the airwaves, the most prominent ads opposing the nuclear agreement have been coming from a 501(c)(4) nonprofit group called Citizens for a Nuclear Free Iran. It's supported by one of the biggest opponents to the deal — the American Israel Public Affairs Committee, or AIPAC. AIPAC and Citizens for a Nuclear Free Iran plan to spend between $20 million and $40 million on this fight. That range vastly dwarfs the $5 million its main adversary has to spend — J-Street, a pro-Israel group that supports the deal. J-Street has been flying in prominent Israelis to visit with lawmakers, such as retired Gen. Amram Mitzna, a former mayor of Haifa and former member of the Knesset, Israel's parliament. Their message? You can still be pro-Israel and disagree with Prime Minister Benjamin Netanyahu, who adamantly opposes the deal. "I'm representing many, many other retired officials from the army, from the intelligence branches, from the foreign office," said Mitzna. "Many of us do feel that we have to support and to back the U.S. with this deal." Among those lawmakers in the undecided camp, lobbying has focused intensely on Democrats. To keep the deal alive, the White House cannot lose more than a dozen Democrats in the Senate. "There's a good chunk of members who have really just not moved or given any indication of where they're going to end up being, so it's a lot of everybody just piling on top of them to get them to swing one way or the other," said Kevin Rachlin, a legislative liaison for J-Street. If it's about sheer intensity, here are the numbers. Since the deal was announced mid-July, J-Street has had more than 125 lawmaker meetings. On the other side, AIPAC says it had 400 meetings in congressional offices just last week. J-Street plans to target five states with TV ads. While the open-government group Sunlight Foundation found that AIPAC allies bought TV ad space in at least 23 states. "I will say, I think sometimes lobbying is counterproductive," said Sen. Claire McCaskill of Missouri, an undecided Democrat. "I don't think that high-pressure lobbying tactics are particularly effective around here." That's a perspective echoed by probably the most scrutinized Democrat who still hasn't weighed in on this deal — Chuck Schumer of New York. "I'm not going to let pressure or politics or party influence my decision. And then when I think my questions have been answered, I'll let people know how I feel and why. Plain and simple," Schumer said. Schumer is the man in line to be the next Democratic leader in the Senate. He has always been a staunch ally of AIPAC. And groups working with AIPAC don't want Schumer to forget that now. Even before the deal was announced the Emergency Committee for Israel (ECI) ran ads in New York, urging voters to call Schumer and tell him to oppose the deal. Noah Pollack, the executive director of ECI, says if you're a Jewish lawmaker, like Schumer, it's going to be hard to ignore statements by some Iranian leaders calling for the destruction of Israel. "You yourself have a Jewish conscience that makes all of this very, very disturbing," said Pollack. But some Jewish lawmakers say their faith does not make the decision more complex than it already is. "In the Jewish community itself, there's division as to whether to support this issue or not. It's pretty evenly divided from what we've seen in the correspondence we've received," said Democratic Sen. Ben Cardin of Maryland. "I think whether you're Jewish, not Jewish, you want to do what's right for this country." Supporters and critics of the agreement have six weeks to intensify the pressure on lawmakers before Congress has to vote.